So I cut my hair yesterday as well as the usual beard trim when I come of course. It is slightly alarming when teenagers consistently guess your age at between 35 and 45. I do have white hair in my beard and my hair was kind of long so I figured that was it. Then I went to the store today to buy some beers and the girl at the check out didnt ask me for ID. everyone gets asked for ID, its America. What is going on? So I have just finished my first stint here as “course director” for a 22day white water and mountaineering course. At best this job entails me paddling rivers, climbing mountains and generally hanging out in beautiful places on my own and at worst involves me dealing with parents, behavioral issues, airlines and phonecalls. It was a pretty good mix for me and now I have 4 days off before the next 25 day stint. After that Emmas coming over and we are off on a climbing road trip south through Oregon and California. Woo hoo. The cool tree at buckskin camp on the deschutes. 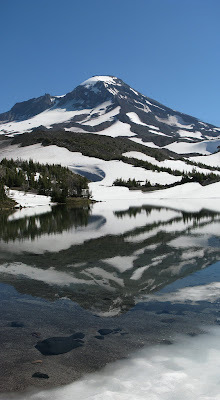 South sister reflected in Camp lake. The Ridge in the foreground was my access route over the mountain to get from one group to the other. Colby’s birthday cake (no bake cheese cake with strawberry jam) which we ate while the students were on solo. A helicopter lands a bit close to one of our gear boats (bottom left) as the desert burns. The life of a course director. Checking messages on my phone and drinking coffee on the summit of middle sister (10,056ft) at 8.30am. I then carried on to the summit of South sister (in front of me and 10,300ft) for lunch. A good day but a tiring one. Climbing the middle sister via the south ridge with students.